Great list, Jen. Enjoy your time off from the blog — and have a Merry merry Christmas! I’m in the middle of RUSSIAN WINTER (by Daphne Kalotay) and I’d like to finish WAR & PEACE (by Leo Tolstoy) even though the latter is a year-long read-along. We’ll see .I’m also working though the holidays and I might be overly engrossed in a technical manual by default. Enjoy your Christmas, time with family and the chance to dive into some great books! I’m definitely looking forward to reading The Weird Sisters in the coming month, and you have lots of other great titles on your list. Merry Christmas! I am *super* excited for GALORE! I hope you and your family have a very Merry Christmas…and that you work a couple of books in too. 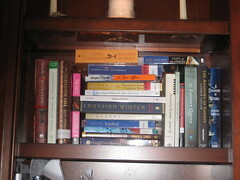 RUSSIAN WINTER is on my list, too. Looks big, thick and hearty and seems appropriate for this time of the year! Happy Xmas Jen! Two down. Only 21 to go. GO! What a great stack. Enjoy your time off and happy reading! I have high hopes for my next week and a half–two four hour bus rides, not too many plans for rhode island, etc, but even if i read a ton, i’ve still got so many more on the shelf! That is the real problem. Even if I were to magically read ALL Of these books, it would barely make a dent in the books I want to read ‘soon,’ let alone my other library, review, and TBR books. I am working that week as well but also have that feeling that I ought to be able to do so much just because it’s the holiday week. It’s easy to forget that most of these holidays just add more work to The Mom’s day! You’ll be able to knock out You Know When the Men are Goen in just a few hours – I enjoyed it a lot but it was a very quick read. Revolution has my interest. And what are you kidding here? You will probably read them all! Have a great week and a half off and we’ll see you back for the new year! I wish! That is too much for a great month (I can get to 23, but only counting audio), and I have a busy 10 days ahead. Excited to see Dragonfly in Amber on the list, and I can’t wait to see your review. Enjoy your holiday time! I am hoping to get a lot of reading done over the holidays, but I have to work too. Still, I think I may get some extra reading time in. I am only working a half day today and tomorrow, so maybe that will enable me to read a little more! There are some great ones on that list. Some new to me. Some I too can’t wait to get to. Jane Eyre is wonderful Xmas reading! Also, I will be reading The Weird Sisters once I get back from Xmas holidays, so I hope it’s good! Good luck with all the reading and have a happy happy holiday! These are awesome choices even if you can’t get to them all! And you’ve already read two, so you’re doing well. I have my own “Christmas reads” pile. It’s about nine strong physically but probably beats yours in my head. I keep thinking, “Oh, I’ll be able to read this next week” – I do have 10 days, but I want to do other stuff as well, so in reality it’s looking unlikely. I’m rereading The Thirteenth Tale too, it’s one of my favorites. Good luck and Merry Christmas! Good luck with all these books! I think you’ll be able to finish more than you think. I definitely suggest reading Jane Eyre before jumping into the Eyre Affair by Jasper Fforde. You’ll miss out on a lot of great jokes and plot twists otherwise. I’m curious to see what you think about The Novel Bookstore. I tried reading it, but only got about 2 pages in before finding it too dull to continue. 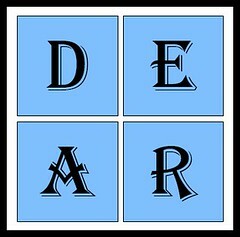 I used to LOVE D.E.A.R. too! I had forgotten all about it. Hope you had a nice Christmas, looks like you’ve gotten some headway on that TBR pile (all the books crossed out, I presume). I also have Dragonfly in Amber and Jane Eyre sitting on my TBR shelf. Yup! I’ve finished a few, although this week I don’t seem to be getting much of anywhere. DEAR is going to be my motto for 2011! Enjoy the time away from the blog to enjoy the holidays and do some reading!